Keiko Fukuda, the world’s highest ranking female judoka, died on February 9th 2013, just a few months short of her 100th birthday. 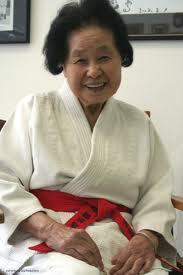 She was the last living student of judo’s founder, Kano Jigoro. She held the rank of ninth dan and though she was awarded 10th dan by the USA Judo Federation, the Japanese Kodokan refused to ratify it. The Kodokan barred any woman from holding a rank above 5th dan, which Fukuda obtained in 1953. It wasn’t until 1972 that the Kodokan granted her 6th dan making her the first woman to be promoted beyond 5th dan. I believe the documentary about Fukuda was completed and given a public viewing, in her presence, in 2012. Fukuda lived in the USA, and died at her home in San Francisco. ©Amongst Other Things – 努江虎 – 노강호 2013 Creative Commons Licence.